Dr. Waggoner started treating patients in 1987. He was first introduced to chiropractic care in college after a sports injury to his lower back and hip. He was told by a medical doctor that his season was over, and it would take 6 months to heal. The chiropractor performed manipulation and therapy which allowed him to play soccer again within two weeks! Dr. Waggoner was sold on chiropractic, and began to pursue the necessary education to become a chiropractic physician. Dr. Herb Schneider was his mentor, and upon graduation practiced with him for 5 years. 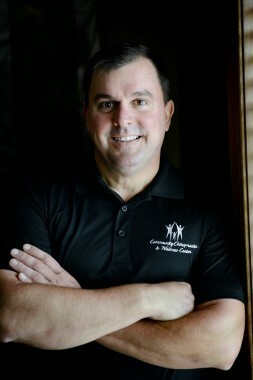 Dr. Waggoner is currently the owner of Community Chiropractic & Wellness Center (CCWC. ), and one of its three practicing physicians. CCWC has two locations; one in Shipshewana & the other in Millersburg. Dr. Waggoner started CCWC in 2009 with the dreams of incorporating a wellness clinic and mentoring younger chiropractors. Dr. Waggoner loves helping people obtain good health naturally through the many avenues of treatment you see on this website. It is his dream to continue to treat patients the rest of his life. He and his wife, Juli, would also like to spend time on the mission field in Ethiopia. Having a well trained staff will allow this to happen more and more over time. Dr. Waggoner is married to nurse Juli who fills in as a decompression specialist. They have 6 children, and enjoy family vacations and mission work.